Bag signs are simple, quick, and easy! Poly Bag Signs are made from weather resistant heavy duty polyethylene with an opaque lining to eliminate ''see thru''. Printed on both sides for maximum exposure. Great for Political Candidates, Issues and Causes and to advertise events or businesses. 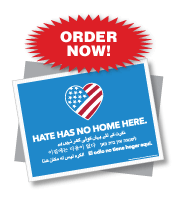 Cheap Political Bag Signs with small minimum order. If you need less than 1000 signs check out our long lasting corrugated plastic political signs. Bag sign edges are sealed to form a two-sided 16'' x 26'' sign. Frame is 25'' x 34'' (Sign frame included). Simply push steel frame into ground. Then, slip the political sign over the sign frame. Bag signs can be used for advertising to promote businesses, events, or political campaigns. SignOutfitters.com manufactures cheap bag signs without sacrificing quality using a state of the art Flexographic printing process. Need a smaller quantity? 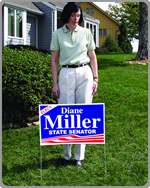 Check out our Corrugated Plastic Yard Signs - Cheapest political sign prices in the industry. 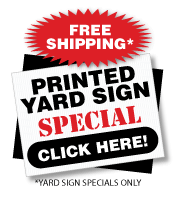 We also print custom yard signs. Political bag signs are simple, quick, and easy! Simply push steel frame into ground. Then, slip the political sign over the sign frame. These signs are great for General Contractors, Grand Openings, Open Houses and Political Candidates. Bag Sign Material - White polyethylene with opaque lining. Sign wire frames are made from heavy-duty, high-tensile, spring steel wire for easy insertion into the ground and long lasting upright bag sign display. Size - Side edges are sealed to form a two-sided 26'' x 16'' bag sign. Sign Frame is 25'' x 34''. Bleed - Bleed not allowed. Imprint can be no closer than 1/2 inch from edge. Production Time - Approximately 5 working days after receipt of art or proof approval. Production Method - Flexographic Printing. Shipping Weight - Approximate per 1000: Bag Signs - 130 lbs., Sign Frames - 600 lbs. Packaging - Bulk. Bag signs are packaged in 250's. Frames are packaged seperately in 100's. Please Note: Color Match by quote only. Contact Customer Service with your Pantone Matching numbers. 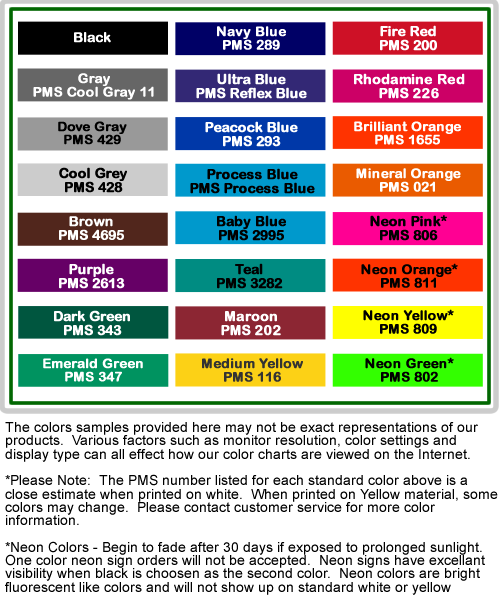 Flexographic inks are water based for line colors and UV cured for four-color process. All formulations are made with lightfast pigments. Flexo items are typically printed on paper and are intended for indoor use only. Flexo labels that require scuff resistance or that will be used for product packaging such as shampoos, soaps, and oils need either a UV cured clearcoat or overlamination for protection.